They say every dog has its day, and that day is today — National Dog Day. Here are 10 ways guests can celebrate their love for their four-legged friend at Walt Disney World Resort. 1. Pets can romp and play while you’re away at Best Friends Pet Care at Walt Disney World Resort. Furry friend deserve the very best, and that’s what they’ll get as guests at this luxury boarding facility. VIP packages include a private room and relief area, a bedtime story, flat panel TV for movie watching, and much more for purchase. For more information about Best Friends Pet Care, call (877) 4 WDW-PETS. 2. If you’re searching for a pet-friendly resort, then you’ve come to the right place. Disney’s Fort Wilderness Resort & Campground offers site-specific campsite loops that welcome pets. 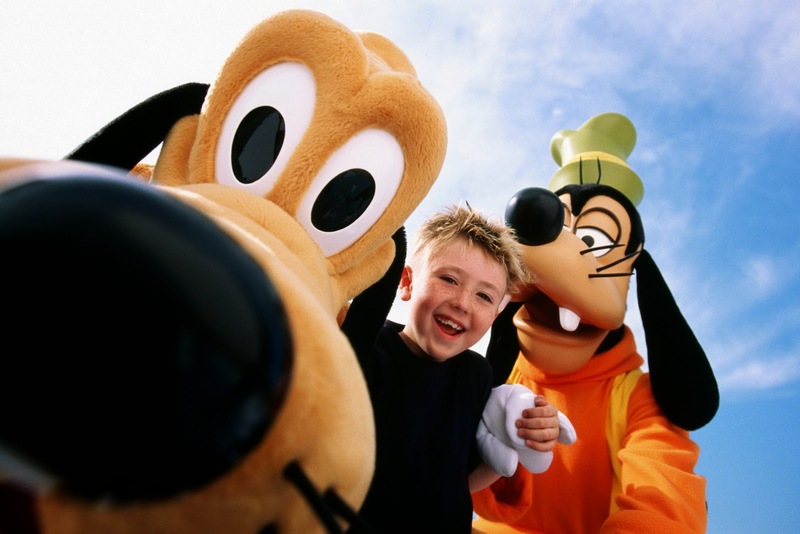 Premium, full hook-up and preferred campsites allow furry friends to join in on a Walt Disney World vacation. 3. Waggin’ Trails Dog Park at Disney’s Fort Wilderness Resort & Campground is the place for dogs of all ages to prance and play leash-free during their stay at Walt Disney World Resort. The park is open daily from dawn to dusk and it features several watering stations to help keep your four-legged family members cool while playing. 4. Guests are sure to have the most stylish pup on the block after shopping for the trendiest items for their dog at Happy Hound. Items range from personalized collars to engravable dog tags from this new kiosk at the Downtown Disney Marketplace. 5. Tony’s Town Square Restaurant at Magic Kingdom is popular as the place that started it all with the canine couple, Lady and the Tramp. This charming restaurant pays tribute to the smitten pooches, and serves the finest Italian foods including fresh zucchini fries, chicken parmesan and Tony’s Chocolate Cake. 6. Dogs are family. The Disney Parks Authentic Family Car Window Decal shows all who pass your vehicle that your dog plays an important role in your family, and is most definitely a Disney dog. The doggy decal features a happy pup donning Mickey Mouse ears. These decals are sold separately and can be purchased from most Disney merchandise outlets across Walt Disney World Resort. 7. For guests who are homesick for their pet during their stay at Disney, favorite Disney dogs such as Pluto and Lady from Lady and the Tramp are featured as cuddly, lovable plush toys. These plush pooches can be purchased from most Disney merchandise outlets across Walt Disney World Resort. 8. If their canine works as a service animal, guests will be glad to know that their trained service dogs are welcome in most locations at Walt Disney World Resort, including theme parks (just not on most attractions) and are welcome at any resort hotel. Service dogs must remain on a leash or harness at all times, and must use designated relief areas. 9. Meet the lovable Disney Dog Pluto at Chef Mickey’s character breakfast at Disney’s Contemporary Resort. Pluto joins pals Mickey Mouse, Minnie Mouse, Goofy and Donald Duck. Characters pose for photos, sign autographs and often lead diners in song and dance during breakfast. Over at Disney’s Animal Kingdom, guests can see what’s “up” with Russell and his four-legged companion Dug. The pair of friendly adventure seekers will pose for photos and sign autographs on Discovery Island. 10. Enchanting stories and characters from Fantasyland come to life for Magic Kingdom guests in Disney’s Festival of Fantasy Parade. The daily parade features Disney Dog, Pluto, and many of his friends. The bright costumes, energetic music and array of Disney characters are sure to please Magic Kingdom guests of all ages.